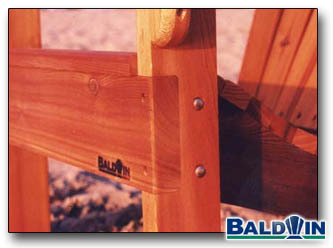 This is a close up of the Baldwin Chair. We press the Stabilizer into the "dado" cut in the front of the Front Leg after applying special outdoor wood glue. The front leg is secured to the back leg with stainless steel carriage bolts and screws. This combination of joinery gives our chair great stability and strength. We air dry the lumber for six months so you will not get any shrinkage in our joints. This chair will be around for a long time!